WGMedia creates and activates Public Relations and Strategic Content Campaigns for global brands and events in the sectors of sport, technology and travel & adventure. 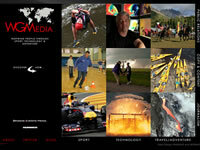 The website creation was a collaboration of work between WGMedia and WebAlert. The design & artwork concept provided by WGMedia which was then brought to life with a bit of WebAlert love and attention !